During the past six years (2012-2017), the author has made 160 trips where more than 98% was by air travel. The breakdown included 55 long-haul travels (>3 hours flying, impacted 2 meals) and 105 short-distance travels (<3 hours flying, impacted 1 meal). The average trip was 14 days. His health targets are as follows: daily glucose below 120 mg/dL and metabolism index (MI) below 73.5%. He used big data analytics method and his developed MI model to perform this traveling analysis. Prior to 2015, his average long/short glucose and MI during traveling days were 140/133 mg/dL and 93% (unhealthy status). After 2015, his long/short glucose and MI were 126/126 mg/dL and 66% (healthy status). In the six-year period, the average long/short glucose and MI were 135/130 mg/dL and 83%. Therefore, after 2015, he was cautious about the food he ate during his travel days and found ways to take 4,000 post-meal steps within the airport. This dual-improvements are reflected in his lower glucose value of 126 mg/dL and metabolism index of 66%. 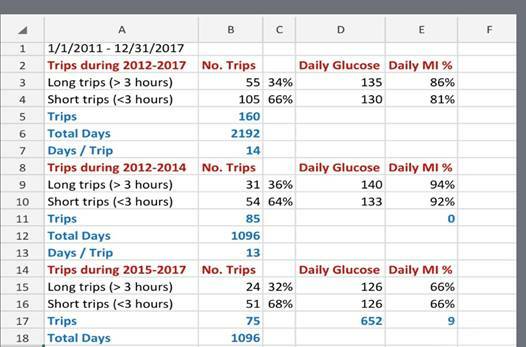 This analysis results are useful for T2D patients who travels frequently and wants to know traveling’s impact and glucose controlling methods.